In her 1955 book, The French Broad, author Wilma Dykeman described the world’s third oldest river as “too thick to drink and too thin to plow.” Since then, there have been vast improvements in water quality and pollution controls thanks in part to the WNC Alliance, the primary protector of the river’s watershed. 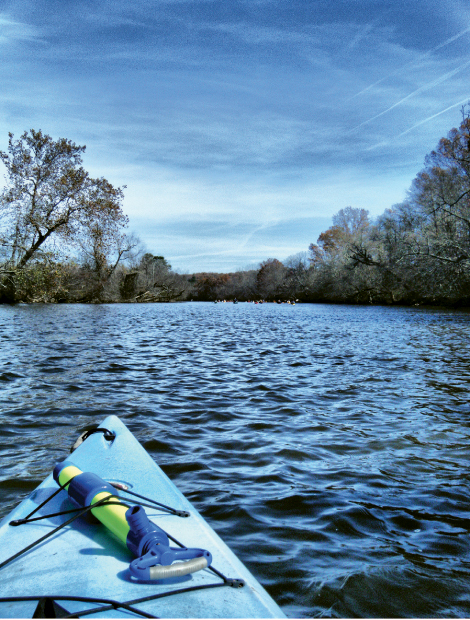 In June, paddlers can get involved with the group’s conservation efforts and gain an appreciation for the waterway by signing up for the Save the French Broad River Float. “The more people we can get on the river to see it firsthand, the more they’re going to want to protect it,” says French Broad Riverkeeper Hartwell Carson, who will lead this year’s adventure. The nine-day trip guides paddlers 115 miles from the headwaters in Rosman, where the river winds through rural farmland, and includes a stop in Asheville to explore the Biltmore Estate Winery. The last three days of the journey, paddlers plunge down class II, III, and IV rapids near Hot Springs. Along the way, activities balance activism and enjoyment as boaters engage in water testing and river cleanups, and pass the afternoons fishing. Most nights are spent camping along the riverbank. If tackling the entire trip sounds too ambitious, boaters of all skill levels can join in for two, four, or five days. Registration fees and sponsorship dollars raised through a Paddle-a-Thon will help keep the river clean for all to enjoy. June 15-23; Register by May 28.